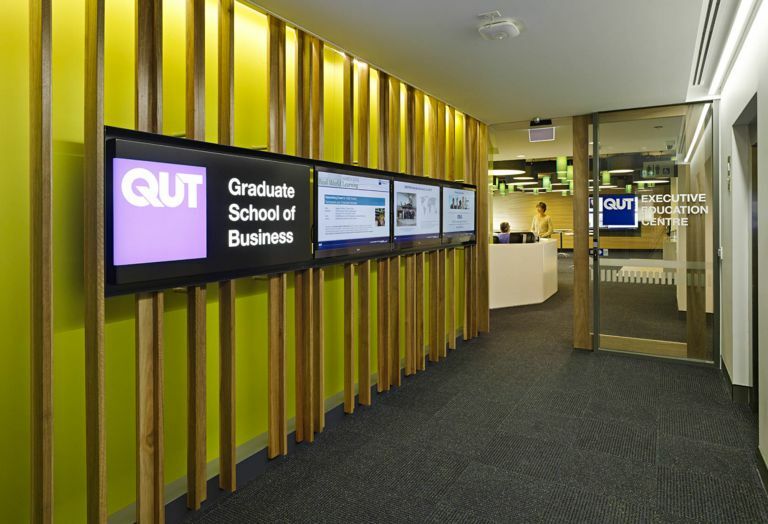 As part of a long-standing relationship with Queensland University of Technology (QUT), spanning 17 years and multiple projects to date, Schiavello Construction’s Queensland division has transformed a traditionally tiered university lecture theatre into a multi-platform, multi-purpose teaching and study environment. Designed by RAL Architects, the resulting space is cocooning but in no way isolating. Frameless glass balustrades define study zones without infringing on sightlines or hindering natural light. An urban feel pervades the traditional university archetype, reinforcing a sense of openness, community, and collaboration. A glazed curtain wall now marks the main theatre entry. Our team remodeled the entryway by first cutting a six-meter high opening into the off-form concrete wall, before installing the glazed curtain wall. Additional windows, including a cantilevered window protruding from the northern wall, were installed to take full advantage of the Queensland sunshine. Contrasting levels and landing pads have replaced the traditionally tiered seating arrangements. The central deck and upper floor areas were constructed of structural steel frames with a plywood subfloor and feature brush box T&G timber flooring. 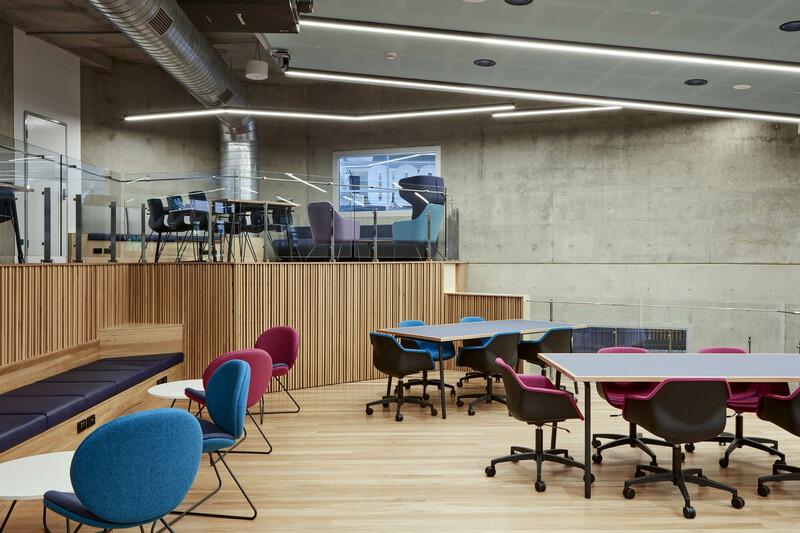 The brush box timber is repeated on the lower level seating areas to unify the space, while the environmentally conscious Marmoleum flooring reflects QUT’s commitment to sustainability. The faceted birch plywood walls introduce visual and textural intrigue to the study area. Constructed to resemble an accordion fold, the architectural structure is acoustically treated and also conceals part of the air conditioning system. An acoustic set plaster ceiling was installed in the lower level to add to the contemporary feel of the space, while enhancing functionality. Edge-lit hexagonal panels of varying sizes and orientations draw attention to the upper level ceilings. Here the plywood panels meet both design and functional lighting needs. “The QUT D101 theatre transformation is just the latest project in our ongoing relationship with the university. We’re proud to have been part of much of the university’s recent refurbishments, fitouts, and construction, and look forward to helping them transform their facilities into a contemporary and innovative one reflective of their students.” – Steven Kourevelis, Director and State Manager, Schiavello Construction QLD. 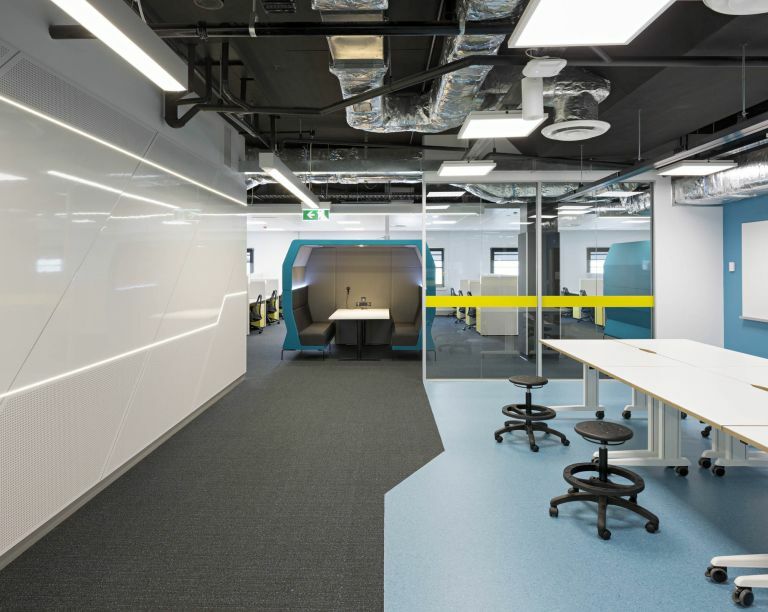 Together with James Cubitt Architects, Schiavello has transformed QUT’s level 11 S Block into a modern study and research facility fit for the world of robotics. 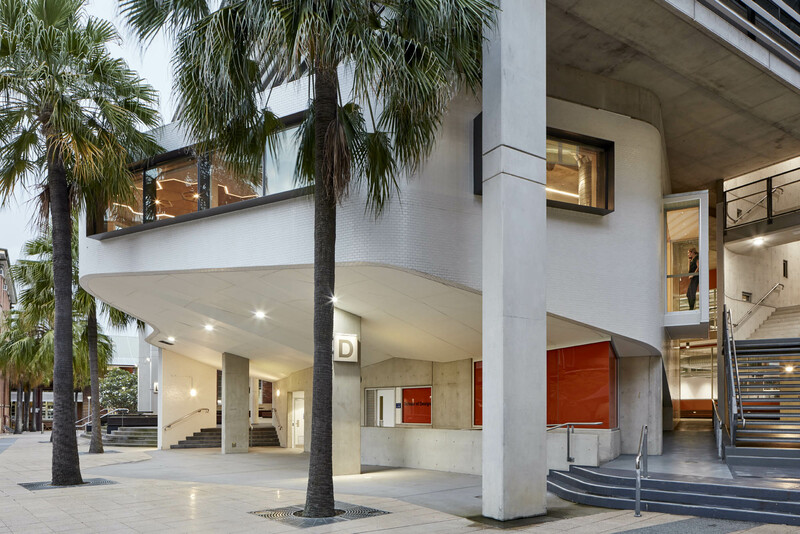 In collaboration with Wilson Architects, Schiavello's QLD team refurbished the Queensland University of Technology (QUT) Executive Education Centre. We deliver unique learning spaces.